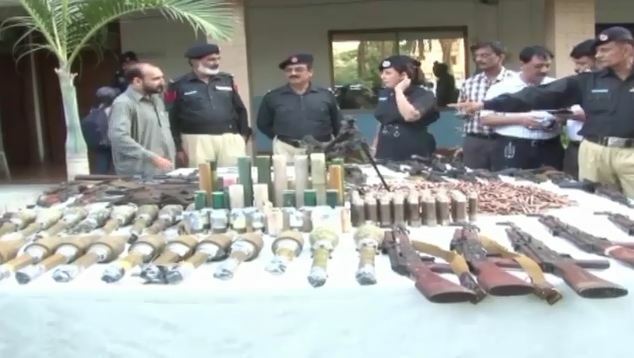 KARACHI (92 News) – Police and law-enforcement agencies have arrested five suspects and seized huge cache of arms and ammunitions during an operation in Mehmoodabad police precincts on Wednesday. Police and law-enforcement agencies conducted a raid in Karachi’s Mehmoodabad area and seized huge cache of weapons including SMG rifles, 20 RPG Rockets, LMG rifle, hand grenade, Arwen launcher, 25 SMG magazine, 24 Arwen rounds, 68 small Arwen rounds, 1800 rounds and steel belts. Additional IG Karachi Mushtaq Sukhera reached the office of DIG South and appreciated police personnel. Addressing the press conference, he said that the weapons belongs to Uzair Baloch group of Lyari gang war.